Don`t you sometimes feel a pang of regret when dropping a beautiful empty bottle into the recycling bin? Or if an exceptionally beautiful bottle just gets dusty in a corner but you can`t bear the idea of throwing it out? With our help you can make something extraordinary of your favourite empty bottles. How about an individually handcrafted bottle clock made from your original bottle and label? Just send us your empty bottles. The glass bottles are melted at a high temperature in a special kiln and transformed into a unique bottle clock. Unfortunately we can`t guarantee that we will succeed every time as not every bottle is suitable for the process. Of course you don't have to pay anything if we fail to produce a bottle clock. Triangular shaped bottles and ones with short wide bodies are not suitable in most cases. On average the whole process takes about two weeks. 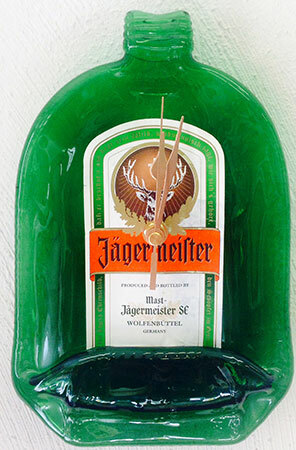 The price for a bottle clock made of a normally sized bottle is €29.90. Please be aware that we charge € 34.90 for Champagne, Havana Gold and Bombay Gin bottles as there is considerably more work involved and removal of the label is more complicated. Ideally you can send us two or three bottles. As each bottle reacts differently within the transforming process it helps us to find the optimal procedure if we have more than one bottle available. If you only have one, that's also no problem at all. We always try our very best to get the optimum result for your bottle. How is your bottle clock created? The bottles you have sent to us will be melted at a high temperature in our special kiln. Each one will be individually shaped and unique. Due to variations in bottle sizes and labels, and the handcrafted nature of the product, no two bottle clocks are identical. The labels will be sealed in a special procedure which protects them from bleaching out and being scratched or getting dirty. Due to the handcrafted nature of the product, no bottle clock will look exactly like the examples shown in our online shop. Kindly add a cover note with your full postal address, including your email adress. As soon as your bottle clock is ready we will send an invoice to your email address. After payment has cleared, we will ship your bottle clock within Germany as an insured DHL parcel for 6.90 Euros. Please ask for shipping costs to other countries before sending us any bottles. All prices include VAT zzgl. Versandkosten. Alle Artikel solange der Vorrat reicht. Änderungen und Irrtumer vorbehalten.